It’s corn maze season! Lace up your tennis shoes and get ready to make your way through a corn-stalk labyrinth. We’ve rounded up 35 of the coolest corn mazes across the country for 2016. Did your state make the cut? Magnolia Corn Maze is located in south Alabama, and over the past eight years has evolved into the elaborate, family-fun attraction it is today. Visitors can even host a party, spend time around fire pits, or play a round of paintball. Hours: Friday: 5:30 p.m. to 8:30 p.m., Saturday: 11 a.m. to 9 p.m., Sunday: Noon to 5 p.m.
October Hours: Monday: Closed, Tuesday – Thursday: Noon to 8 p.m., Friday: Noon to 11 p.m., Saturday: 10 a.m. to 11 p.m., Sunday: 10 a.m. to 8 p.m.
November Hours: Monday-Wednesday: Closed, Thursday-Friday: Noon to 8 p.m., Saturday: 10 a.m. to 8 p.m., Sunday: 10 a.m. to 5 p.m. Farmland Adventures is located in scenic Springdale, Arkansas with many activities available for visitors, including human foosball, roping and riding adventures, plus a 9-acre corn maze. Hours: Sept. 9 – Nov. 5: Thursday: 3 to 9 p.m. (October only), Friday: 1 to 9:30 p.m., Saturday: 9 a.m. to 9:30 p.m. Sometimes you have to go big or go home. While most corn mazes are between 5 and 20 acres, Cool Patch Pumpkins in Dixon, California has a maze that comes in at a whopping 63 acres. A previous version has even been featured in the Guinness Book of World Records. The Fritzler Corn Maze is Colorado’s original and premier corn maze, offering bushels of fun. The maze is divided into two phases, aiming to challenge and thrill those seeking to find the single exit from the twists and turns of golden corn stalks. September Hours: Monday – Thursday: Closed, Friday: 5 to 10 p.m., Saturday the 17th: 11 a.m. to 5 p.m., Saturday: 11 a.m. to 10 p.m., Sunday: Noon to 5 p.m.
October Hours: Monday and Tuesday: Closed, Wednesday and Thursday: 6 to 9 p.m.(beginning October 12th), Friday: 5 to 10 p.m., Saturday: 11 a.m. to 10 p.m., Sunday: Noon to 5 p.m. The 2016 maze design celebrates “Naturally New England,” focusing on heritage and commitment to sustainable agriculture. Visitors can enjoy the 7-acre maze and learn fun facts about New England states and farming traditions. Hours: Open daily 9 a.m. to 9 p.m.
Fifer’s 12th annual Corn Maze Fun Park features a special Peanuts theme. This year, as visitors venture through the corn maze they’ll have the chance to play Peanuts-themed bingo. And on Saturdays, guests can also kick back and enjoy the sounds of live music. Hours: Monday-Saturday: 10 a.m. to 5 p.m.
Uncle Shuck’s maze is a 12-acre cornfield with approximately four miles of trails, twists and turns, sometimes leading visitors to a dead end. Hours: Sunday-Thursday: 10 a.m. to 6 p.m., Friday-Saturday: 10 a.m. to 10 p.m.
Giggles, chuckles and belly laughs will be heard among ears of corn this year at Farmstead’s 2016 maze – Idaho’s original corn maze – which displays Saturday Night Live star and Tonight Show host Jimmy Fallon. Hours: Monday-Thursday: 4 to 9 p.m., Friday: 4 to 11 p.m., Saturday: 10 a.m. to 11 p.m.
Venture into this interplanetary maze for a celebration of 50 years of Star Trek. Choose from one of five different mazes based on how well you think you’ll navigate. Hours: Wednesday-Thursday: 3 to 10 p.m., Friday-Saturday: 10 a.m. to 11 p.m., Sunday: Noon to 10 p.m. The 8-acre maze at Beasley’s will be part of a national celebration of the 50th anniversary of “It’s the Great Pumpkin, Charlie Brown.” Look for Snoopy, Charlie Brown and other Peanuts classics as you try to navigate your way out. Hours: Friday-Saturday: 10 a.m. to 5 p.m., Sunday: Noon to 5 p.m.
Devine’s Corn Maze & Pumpkin Patch in Harrodsburg, Kentucky has been nominated in the 10 Best Readers’ Choice travel award contest and selected as a contender for Best Corn Maze. Hours: Friday: 6 to 10 p.m., Saturday: 10 a.m. to 10 p.m., Sunday: 1 to 5 p.m.
Dixie Maze is one of the oldest cornfield mazes in the south and the original corn maze in Louisiana. It’s over 8 acres with 4 miles of pathways. Treworgy corn maze is the longest continually running maze in Maine. To make the experience even more fun, there’s a special map with riddles for guests to figure out as they visit “stations” inside the maze. Complete the puzzle and bring your map to the cafe, and get a free soft-serve ice cream cone. Hours: Tuesday-Sunday: 10 a.m. to 8 p.m.
Summers Farm offers pure family fun, encouraging visitors to get lost in 12 acres of tall corn stalks. The maze is divided into two phases that will accommodate all ages. Hours: Monday-Thursday: 1 to 7 p.m., Friday: 1 to 4 p.m. , Saturday: 10 a.m. to 10:30 p.m., Sunday: 10 a.m. to 7 p.m. This year’s maze theme is “See America” to commemorate the 100th anniversary of the National Park Service. Tourists visiting Mike’s Maze will be delighted to find the farm transformed into a “National Park” complete with its own geyser, “Ol’ Reliable!” Enjoy wandering the maze on a search for wondrously life-size “wildlife” specimens while aspiring “Corn Field Naturalists” can challenge their intellect with the Ranger-In-Training game. Hours: Saturday-Sunday: 10 a.m. to 5 p.m., Mike’s at Night on Friday & Saturday: 7 to 11 p.m. This fall at Jacob’s Corn Maze, prepare to go on an adventure like any other, as you scale the world’s tallest mountain, Mt. Everest! The 10-acre corn maze is sure to get you lost in the snowy peaks. Hours: Sunday-Thursday: 10 a.m. to 6 p.m., Friday-Saturday: 10 a.m. to 9 p.m. Check out Minnesota’s largest maze and explore a larger-than-life version of the new U.S. Bank Minnesota Vikings Stadium. A portion of every ticket sold will be donated to the Vikings Children’s Fund. Hours: Saturday-Sunday: 10 a.m. to 6 p.m.
Visit the impressive corn maze, as well as group hayrides, roaring campfires, a pumpkin patch and an elaborate three-story gum-ball coaster. Hours: Sept. 9 – Oct. 30: Friday: 4 to 9 p.m., Saturday: 10 a.m. to 9 p.m., Sunday: 2 to 6 p.m. The 20-acre corn maze is carved into 6-foot tall stalks of corn, celebrating the 50th anniversary of Peanuts. There are endless pathway possibilities around every corner, including dead ends. See if you can make it out. Hours: Friday: 5 to 9 p.m., Saturday: 1 to 9 p.m., Sunday: 1 to 6 p.m. Skinny Bones’ 10-acre corn maze is the most popular attraction on the farm. Challenge your friends to a scavenger hunt, and if you master the maze, you’ll win a prize. Hours: Monday-Thursday: 10 a.m. to 3 p.m., Friday-Saturday: 10 a.m. to 10 p.m., Sunday: 10 a.m. to 7 p.m.
New Jersey’s oldest-running corn maze will surely challenge guests to find their way out. Get lost? Scan the special code you find on the nearest post and Happy Day Farm’s personal satellite will send you a picture of where you are in the maze from the sky! Hours: Friday-Sunday: 11 a.m. to 5 p.m.
Ken’s Korny Maze was the first corn maze in North Carolina. It opened in 2000 and has been attracting thousands of visitors every year since. At the start of the maze, each receives a stamp card with the time and the shortest time to complete the maze wins! Hours: Friday: 4 to 10 p.m., Saturday: 10 a.m. to 10 p.m., Sunday: Noon to 8 p.m.
Make family memories at Nelson’s Pumpkin Patch. Pick your own jack-o-lanterns, enjoy some tasty treats, and try to weave your way through the 11-acre corn maze. Hours: Weekdays: 3 to 6 p.m., Weekends: 11 a.m. to 6 p.m. This 20-acre interactive corn maze features a checkpoint game, a farm scene investigation and several other activities. Hours: Friday: 5 p.m. to midnight, Saturday: 11 a.m. to midnight, Sunday: 11 a.m. to 9 p.m. Check out Oklahoma’s largest corn maze at Reding Farm. Guests can ride a cow train, take a regular hayride, experience the “Haunted Maize, Harvest of Fear” or ride the haunted hayride. Hours: Friday: 6 to 10 p.m., Saturday: 10 a.m. to 10 p.m., Sunday: 1 to 6 p.m.
Terrifying creatures stalk you as you make your way through the Haunted Corn Maze. This year, the haunted maze’s theme is inspired by the epic Star Wars stormtrooper! Be prepared for dark ghouls and goblins, scary zombies, and even some Star Wars character zombies. Hours: Sunday-Thursday: 9 a.m. to 5 p.m., Friday-Saturday: 9 a.m. to 10 p.m.
Give in to the Pokemon craze as you wind your way through the Coolspring Corn Maze’s Pokemon Trail. After finding your way out of the giant maze, take some time to relax with a pony ride, a brisk walk through the indoor hay maze, or a scenic hayride. Hours: Friday: 4 to 11 p.m., Saturday: 11 a.m. to 11 p.m., Sunday: 11 a.m. to 8 p.m.
Salisbury Farm’s is the first maze of its kind in New England, with more than a mile of paths in five acres of corn. For a truly unique experience, try the Moonlight Maze under the stars. Hours: Aug. 27 – Nov. 5: Weekdays: 10 a.m. to 5 p.m., Weekends: 10 a.m. to 6 p.m., Moonlight Mazes: 7 p.m. to 9 p.m.
Denver Downs Farm is a Century Farm devoted to agritourism and entertainment. The farm’s corn maze has 12 hidden checkpoints to see which visitors can navigate it the fastest. Additionally, guests can enjoy concerts, fresh produce, and special events like the Pumpkin Prince/Princess Pageant. Hours: Thursday: 5 to 11 p.m., Friday: 5 p.m. to midnight, Saturday: 10 a.m. to midnight, Sunday: 1 p.m. to 11 p.m. Celebrate the 10th anniversary of Charlotte’s Web at Batey Farms this fall in Middle Tennessee. Explore the world of agriculture as you roam through the 14-acre maze – the largest in the state. Hours: Friday: 4 to 11 p.m., Saturday: 10 a.m. to 11 p.m., Sunday: 1 to 8 p.m. Hours: Monday-Thursday: 4 to 9 p.m., Friday-Saturday: 10 a.m. to 11 p.m.
Liberty Mills Farm is home to Virginia’s largest corn maze. It is 25 acres of tricky trails, loaded with story stations and trivia themes. Hours: Wednesday-Friday: 1 to 6 p.m., Saturday: 10 a.m. to 5 p.m., Sunday: 11 a.m. to 6 p.m. This challenging 10-acre corn maze has twists and turns for a tricky (but fun!) family outing. The Treinen Farm Corn Maze is a 15-acre living puzzle, with over six miles of twisty turns filled with clues for solving the puzzle. Hours: Friday: 3 to 10:30 p.m., Saturday: 10 a.m. to 10:30 p.m., Sunday: 10 a.m. to 6:30 p.m. This unique corn maze helps make “dreams” come true for the youth of Casper, Wyoming. All proceeds benefit the Natrona County FFA Chapters and Alumni, and the Arc of Natrona County, both youth leadership and development organizations. Hours: Friday: 6 to 10 p.m., Saturday: 11 a.m. to 10 p.m. Happy to be in the listing! We are a working farm- year round- field crops, black angus cattle, and hogs. The Maze hours are 5pm -10pm on Thursday and Fridays. Saturdays 10am-10pm,. and Sundays 1pm-7pm. There is a seperate haunted event – called the Harvest of Horror – that stays open later on October weekends. (The maze is not haunted). 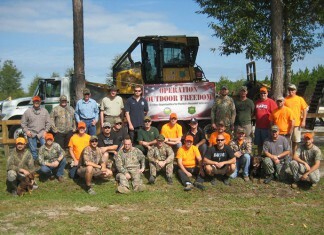 Operation Outdoor Freedom brings Florida veterans together for a healing hunt.